Squeezepenny is made from the Black Spanish grape. This is a sweet, dark ruby colored wine with aromas of blackberries and jam with a savory palate of dark fruits. This wine is a blend of Mitas Hill Black Spanish and Tempranillo grapes. The Black Spanish grapes give the wine its fruit forward flavor and the Tempranillo gives the wine more structure and balance. The wine is then sweetened and is considered to be dessert level wine. It pairs very well with chocolate, raspberry, and other dessert flavors. This wine is not aged, and usually bottled within 6 months of harvest. Squeezepenny is best enjoyed chilled, and soon after purchase. 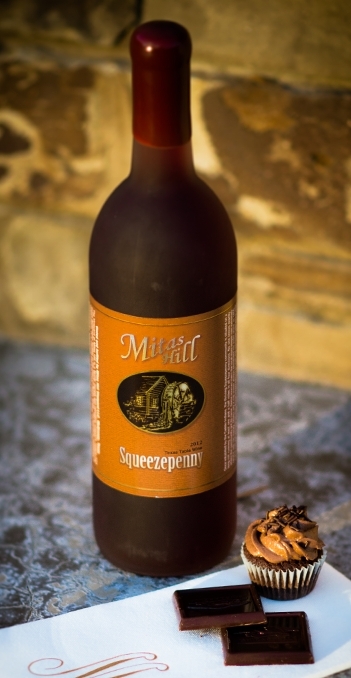 Our Squeezepenny wine is named after the community in which Mitas Hill Vineyard is located. Once inhabited by the Caddo Indians, the thriving Squeezepenny community is situated on a long hill running at least one and a half miles in all four directions. No one knows exactly where the community got its name. Some sources claim the local store keeper was extremely careful with his money. Others say a mill owner always demanded his exact share. In 1855, a grist mill was established thus giving Squeezepenny its start and continued operations until the Civil War. The mill was then used to card wool and cotton, which were spun into threads and woven into cloth for Civil War uniforms. Rock for construction of the historic Collin County courthouse and the old county jail located in downtown McKinney, both built in 1874, was quarried from what is now Mitas Hill. Upon completion, the court house was the tallest building north of San Antonio. The original stone remains exposed on the historic old jail. "This is our sweetest wine yet, which is just perfect for certain palates."